Everyone seeks a sense of place, whether it is his or her own backyard or country. Place reinforces one's sense of self, one's true identity. Through landscape painting, I am seeking a universal sense of place through the natural world. Although a Georgia landscape is different from a Louisiana or a North Carolina one, certain things are the same. While appreciating the uniqueness of each place, I am seeking the common thread that brings us together. 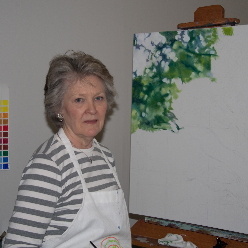 Initially I was classically trained to paint with oils in a traditional manner. Teaching myself to use watercolors, I painted with them exclusively for over twenty-five years. The last six years I addressed issues of social concerns in my hometown, New Orleans, through my art. Displaced by Hurricane Katrina, I have returned to the use of oil paints to explore my new environment through landscapes. Copyright © 2009 - 2019 Susan Loeb All Rights Reserved.